Is your website tuned for SEO? The goal of on-page SEO is to communicate to Google what a web page is specifically about so each page of your website can be categorised correctly in the Google index. There are key elements that Google 'reads' for this purpose: URLs, page titles, headers, on-page copy, anchor text of links etc. All of these need to contain the target keywords to 'describe' to Google what a page is about. Additionally, the meta title and meta description are the elements Google uses to display the listing of a page in search results - where the page title is the heading in the listing, and the meta description is the compelling marketing message that searchers will scan to decide which link they click on. 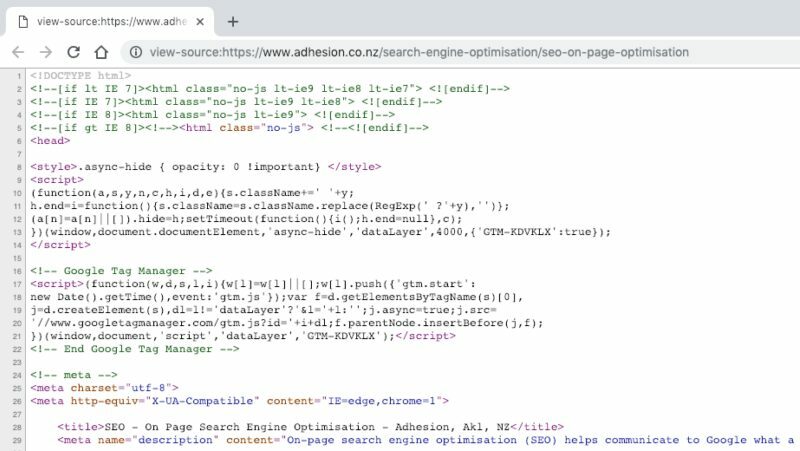 Adhesion uses data from clients' AdWords campaigns, as well as keyword research tools to identify and select the target keywords used to be used for on-page SEO. This data is crafted into an SEO brief that can be implemented by Adhesion or your web developer. To further assist Google's ability to easily crawl and index the website, it's also important to include and submit a comprehensive XML site map through Google Webmaster Tools. Talk to us about the best SEO strategy for your website. Download our Google SEO info pack detailing our packages designed for small NZ businesses.